The teleological intuition of genius is the perception of something beyond words. In his last Russian-language novel The Gift (Дар), "a novel about love and literary growth", Vladimir Nabokov tells the story of Fyodor, an aspiring poet, the development of the young Russian émigré's literary gift and the revelation of his status as a genius. During the course of the novel, the reader learns about Fyodor's struggles and setbacks on his poetic journey towards success. 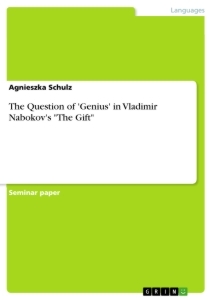 After a short introduction to the author of The Gift, Vladimir Nabokov, and a summary of the novel's plot, the author of this paper gives an overview on the differences between the 'genius' in Romantic literature (through the example of Pushkin's Mozart and Salieri) and the 'genius' as it is described in Nabokov's world and works. In this paper, the author moreover intends to show that both Fyodor's mysterious rival Koncheyev as well as Fyodor's equally artistic and art-loving girlfriend Zina, who also acts as her boyfriend's muse and guiding spirit, play a vital role in the course of Fyodor's artistic maturation which – in a sort of plot twist at the end of The Gift – culminates in him finally becoming a, and revealing his, true genius by writing an extraordinary novel. Given the sheer endless amount of specialized literature on Nabokov's work, the author decided to in this paper focus on the question of 'genius' in The Gift and on its main protagonist's most important external influences. There is, of course, a vast array of motifs and themes that offer interesting starting points for further in-depth analysis which will, however, due to the scope of this paper not be introduced. This paper focuses on English-language sources (especially those of S.H. Blackwell and S. Davydov) and makes use of the English transcription (which is also used in the translation by D. Nabokov/Scammell) for names and places. Born in 1899, Vladimir Vladimirovich Nabokov spent 15 years of his life (1922 to 1937) in Berlin after he and his wealthy aristocratic family, who had "carefully nurtured" Nabokov's (literary) talent from an early age, had to flee Russia after the Revolution of 1918, with a short stay in Crimea and a longer stay in Cambridge to study first zoology, then Slavic and Romance languages, before temporarily settling in Berlin. His father, the editor, journalist and politican Vladimir Dmitrievich Nabokov, was murdered in Berlin by Russian émigré monarchists in early 1922. After a quite extensive Berlin period and due to the political situation of the 1930's, Nabokov and his Jewish wife Véra emigrated first to France, then to the United States of America, where Nabokov would achieve his greatest successes after switching to English as his main literary language. In 1961, the Nabokovs relocated to Switzerland, where Nabokov died in 1977. Nabokov, who was not only a novelist but also a passionate lepidopterist, strongly disliked 'ideas' (and philosophy for that matter: his immense distaste for Sigmund Freud, the Austrian founder of psychoanalysis, is a well-known fact ). His main interest lay in the 'quiddity', i.e. essence, of things, which he aimed to achieve through the use of memory – to be particular, the memory of essential things themselves –, through (literary) art including devices of ani­mating the form, light, shadow, color, etc. of objects, all with the ultimate goal of finding patterns. Amongst Nabokov's favorite words were 'clear', 'lucid', and 'transparent', i.e. words which also describe the 'essence of things.' This essence of things can, accordings to Nabokov, be revealed through art/artifice, which is given to an artist via his gift of being a 'genius.' This genius is able to imagine and reconstruct another reality (a different form of reality), which in turn consists of the connection of essential things. It's queer. I seem to remember my future works, although I don't even know what they will be about. I'll recall them completely and write them. For Alexandrov, this remark uttered by Fyodor to his girlfriend Zina, who turns out to be his muse and, therefore, an integral part in his artistic development, is one of the most important aspects as far as the protagonist Fyodor's and the author Nabokov's shared conception of art is concerned. This parallel between the protagonist and the author is, claims Alexandrov, "crucial for understanding The Gift because [it points] to a way out of [the novel's] circular narrative structure." In The Gift, Nabokov tells the (not entirely autobiographical ) story of Fyodor Konstantinovich Godunov-Cherdyntsev, a young Russian émigré living in Berlin at the end of the 1920's, and how his literary genius matures over the years. Fyodor is described as a developing genius (the Greek version of his name, Θεόδωρος, translating to 'gift from God' ). Zina Mertz, Fyodor's love interest and muse, is a parallel to Nabokov's own wife, Véra. Throughout the novel, the narrator repeatedly switches between first-person and third-person. This mixing-up of levels (metalepsis) creates dimension and thus animates the form of the novel, which for Nabokov was, as has been mentioned above, necessary in order to reveal the quiddity of things. In the first chapter, Fyodor has just published his very first volume of poems (consisting of memories from his childhood on the Godunov-Cherdyntsevs' country estate Leshino), which to his disappointment does not generate positive reviews or even any sort of public interest. After moving to a new rented room, he spends an evening at the Chernyshevski family (Alexander Yakovlevich, who suffers bouts of depression, and Alexandra Yakovlevna), who are fellow Russian émigrés and who have lost their son Yasha to a suicide pact. Fyodor bears a striking resemblance to their late son and is urged by Yasha's mother to use her son's story as literary material, an idea which Fyodor rejects. After a rather unproductive summer, Fyodor finally attends a literary meeting of Russian émigrés where he meets the poet Koncheyev (whose first name and patronym are never revealed), who in Fyodor's eyes is his "only [...] rival" and whom he envies, and with whom he later on has an animated, albeit fictitious, conversation about Russian literature. Fyodor intends on writing a novel about his presumed dead father Konstantin Kirillovich, a scientist who went missing during a scientific excursion in the Russian steppe in Central Asia, in chapter two. Fyodor's mother Elizaveta Pavlovna, who lives in Paris, visits him in Berlin and they both reminisce about their husband and father, whom Fyodor idolizes just as much as he idolizes Pushkin. Not actually believing in his father's death and still hoping for his return, Fyodor decides to write his biography. In the end, he abandons this endeavor due to the fact that he feels unable to capture his father's 'essence.' At the end of the chapter, Fyodor has to move again, this time to a room at the apartment of the Shchyogolev family. In chapter three, Fyodor's developing romance with Zina Mertz, Mr. Shchyogolev's step­daughter, is brought to the fore. Zina, who had already been a fan of Fyodor's poetry even before they had met in person for the first time, wants their relationship to be kept a secret, partly due to her immense distaste for her stepfather whom she finds revolting. After reading an article on 19th century writer and social critic Nikolai Gavrilovich Chernyshevski in a chess magazine (a game that Fyodor immensely enjoys ), Fyodor decides to write a critical, mock-biography about him, while Zina plays a central part during the writing of this book, both as his muse and ideal reader. The fourth chapter of the novel consists of the book-within-a-book about Chernyshevski, called The Life of Chernyshevski, in which Fyodor mocks his writings and tears his heritage and reputation apart. In the fifth and last chapter of the The Gift, the success of Fyodor's biography on Cherny­shevski, which is to a considerable extent also due to the scandal surrounding it, is described. While most reviews are negative, his rival Koncheyev's review of Fyodor's book is actually quite favorable. The night before Mr. Shchyogolev and his wife move to Copenhagen, at last leaving Zina and Fyodor, who believes the two were brought together by fate, alone in the apartment, Fyodor dreams about his father's return. The novel ends with Zina's declaration that Fyodor will be "such a writer as has never been before and Russia will simply pine for [him]" after he tells her about his plans to write "a remarkable novel" about "[his] life, [his] professional passions and cares", which closely resembles the plot of The Gift itself, resulting in a circular story pattern. In Romanticism, the genius artist loves God (who also acts as a mediator and inspiration to the artist who was sent by Him), not another person. The artist sent by God intends to create a harmonic whole out of many singular parts, thereby reaching for the sublime. An example of such a Romantic genius is Pushkin's Mozart in Mozart and Salieri. Mozart, who has – through the energetic force that is God who holds the world together – received a sacred gift, is envied by the non-genius Salieri, who does excel in technique and devotion, but who lacks the divine spark and can only dream of creativity. Salieri, who constantly abnegates his own talent and relies on prayers, plans on murdering Mozart because destiny has chosen me / to stop him; otherwise we're – all of us, / priests, servitors of music – we're all finished, / yes, not just me with my dull reputation... / What future's there for us, with Mozart living / and rising ever upwards to new heights? To your health, / my friend, and to the real bond that joins us, / that joins together Mozart and Salieri, / brothers in harmony. Once in Ordos my father, climbing a hill after a storm, inadvertently entered the base of a rainbow – the rarest occurence! – and found himself in coloured air, in a play of light as if in paradise. He took one more step – and left paradise. In much of Nabokov's writing [...], motifs which indicate the proximity of the otherworldly are those which foreground points of transition between mental and physical states of being. Of the most explicit here are motifs of dreaming, fever, or artistic inspiration. Nabokov had to justify his emigration from his native language and literature to their acquired substitutes. For this purpose, he would argue that "the nationality of a worthwhile writer is of secondary importance" [...] and present himself as a born cosmopolitan genius who has never been attached to anything and anybody but his autonomous imagination and personal memory. Rutledge, Nabokov's Permanent Mystery, p. 5. For Berdjis, The Gift"constitutes the climax of Nabokov's Russian prose." Berdjis, Imagery, p. 15. The English-language translation by Nabokov's son Dmitri Nabokov and Michael Scammell was later revised by Vladimir Nabokov himself. Cf. ibid. Blackwell, The Poetics, p. 243. Cf. Morris, Nabokov's Poetic Gift, p. 457 et seq. Diment, Nabokov's Biographical Impulse, p. 182. Cf. Connolly, The Cambridge Companion, p. xv et seq. Cf. de la Durantaye, Style Is Matter, p. 117 et seq. and Nabokov, The Gift, p. 39, where Fyodor talks about the "disgusting Freudian reek." Cf. de la Durantaye, Style Is Matter, p. 113. Cf. Morris, Nabokov's Poetic Gift, p. 462: Fyodor feels a rush of inspiration when reminded of his "fondest [childhood] memories" with the help of poetry conquering "time and space." Cf. Rutledge, Nabokov's Permanent Mystery, p. 3 et seq. : "Teleological intuition may be that extra sense which comprehends the essence of a literary structure, an innate ability to perceive literary patterns." Cf. also Blackwell, Zina's Paradox, p. 50: "[C]onsidering that indeed pattern and organization (in contrast, say, to pure chaos) do seem to be characteristic of the physical universe at most of its observable levels, we may reasonably propose that the properties of mind are a result of, rather than a cause of, those patterns. The tension between these possibilites is a key element of Nabokov's artistic practice", and ibid., p. 51: "In Fyodor's world, what he is attempting to demonstrate is not a specific sequence of people and events, but an artistic pattern behind and between the events. Words, characters, and dialogues are merely tools for getting at the deeper design." Cf. also Alexandrov, Nabokov's Otherworld, p. 124 et seq. Nabokov, The Gift, p. 191. Alexandrov, Nabokov's Otherworld, p. 113. For Karlinsky, "autobiographical elements are clearly present in the novel." Karlinsky, Vladimir Nabokov's Novel Dar, p. 285. Cf. Davydov, The Gift, p. 358. Nabokov, The Gift, p. 60. Blackwell thinks of Fyodor's relationship to Koncheyev as "an embodiment of his relationship to art generally" (Blackwell, Boundaries, p. 606 et seq. ), while Koncheyev "embodies the boundary that Fyodor feels he must surpass to prove his own originality and literary merit" (ibid., p. 609). Davydov describes chapter two as Fyodor's "Pushkin period" and chapter three as his "Gogol' period", both writers having an immense influence on the young and struggling artist. Cf. Davydov, The Gift, p. 359. In particular, Fyodor uses Gogol's technique of detecting ' пошлость' ' (a distaste for vulgarity, a love of kitsch, boarish behavior) in his mock-biography on Chernyshevski. Cf. ibid., Salomon, The Gift, p. 185 and Blackwell, Boundaries, p. 613 (for the inspiration Fyodor derives from Gogol') and Boyd, Stalking Nabokov, p. 205 et seq. (for the "divine stab" received through Pushkin's spirit). For Fyodor, such an imitation of other artists is not taboo, and, as Greenleaf notes, "[a]s always in The Gift, all roads lead through Pushkin." Greenleaf, Fathers, p. 153. This fourth chapter was not included in the original 1938 publication of The Gift in the Russian émigré journal Contemporary Annals due to political censorship. The Gift was only published in its entirety in 1952, with an English translation released in 1963. Cf. Davydov, The Gift, p. 357, Karlinsky, Vladimir Nabokov's Novel Dar, p. 284 et seq. and Leving, Keys, p. xxi et seq. Nabokov, The Gift, p. 362. Cf. Berdjis, Imagery, p. 193. Pushkin, Boris Godunov and Little Tragedies, p. 137 et seq. Pushkin, Boris Godunov and Little Tragedies, p. 141. Nabokov, The Gift, p. 75. Morris, Nabokov's Poetic Gift, p. 460. Cf. also Alexandrov, Nabokov's Otherworld, p. 109 et seq. Dolinin, Nabokov as a Russian Writer, p. 53. Romanticism in Joseph Conrad's "Heart of Darkness"